In case you missed it, click to read the June 2018 edition of the Brunswick Real Estate News! 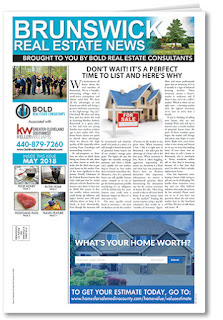 On the cover, we'll help you discover why now is the perfect time to list your home in this seller friendly real estate market. On page two we spill the beans on some of the best farmers markets the Brunswick area has to offer. In addition, you'll also find some great travel and decorating articles, as well as a delicious recipe from Wolfgang Puck.